Where is our basic Freedom of Speech, why the exclusion? Is there a hidden agenda here? Just yesterda, I read that Elizabeth May, Green Party Leader Canada was excluded from the televised debates that will take place. May is understandably in shock. Marco Dubé, a spokesman for the broadcast consortium that hosts the debates, confirmed the group decided unanimously that a formal proposal will only be made to the leaders of recognized parties in the House of Commons — Conservative, Liberal, NDP and Bloc Québécois (http://www.cbc.ca/news/yourcommunity/2011/03/elizabeth-may-should-the-green-party-leader-be-invited-to-the-tv-debates.html). Consortium spokesman Marco Dube said Tuesday only the four leaders whose parties are represented in the House of Commons Conservative, Liberal, NDP and Bloc Quebecois have been invited to take part. May issued a statement saying the consortium is flat wrong to exclude her. “They have no grounds to stand on,”she said. “They are making up the rules to please Stephen Harper and Jack Layton. It’s juvenile, old-boys stuff.” She said democracy is the victim. It seems like history is repeating itself. 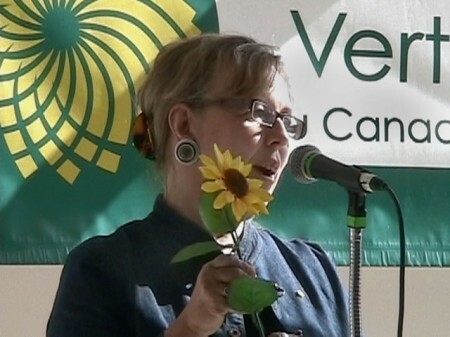 In 2008, the consortium reversed a decision to exclude May after Harper and Layton backed off a threatened boycott should the Green leader be given airtime, and she took part in the federal debate for the first time (http://www.winnipegfreepress.com/breakingnews/greens-elizabeth-may-will-fight-broadcasters-decision-to-ditch-her-from-debate-118927234.html). May put in a feisty performance, proving to be an effective thorn in Prime Minister Stephen Harper’s side. That helped propel her party to its best-ever electoral showing just over 937,00 votes, or 6.8 per cent of the total but none of its candidates, including Wilson and May, were elected (http://www.fm96.com/channels/newsinfo/localnews/Story.aspx?id=1393406). According to the editorial in the Ottawa Sun, the broadcast consortium has every right to choose which leaders it invites to its televised debates. The choice not to invite Elizabeth May was a bad one. Liberal Leader Michael Ignatieff believes that May should be present at the debates. The Bloc Party is quite willing to leave the decision to the broadcasters while the NDP spokeswoman, Kathleen Monk initially said the decision was up to the consortium, but issued a later statement saying her party has no problem if May is in the debate. Monk added, however, that the rules should be consistent. “While we do not have a vote at the consortium, we think it would benefit the process to have clear criteria so that this matter is dealt with fairly” (http://www.fm96.com/channels/newsinfo/localnews/Story.aspx?id=1393406). I read elsewhere that NDP leader Jack Layton said he supports May’s inclusion and Prime Minister Stephen Harper has suggested he’s not opposed. May is not taking this lying down. She is determined to be at the debates. She has a lot of support from people who believe that she has a right to be there. Some believe that she is a great alternative to the traditional party leaders. May receives 10% of the popular vote. May is appealing to the public to help fight the decision issued by the Canadian Broadcasting Consortium to bar her from the debates. She says the consortium is even refusing to let her know when and where they are being held. An independent television station, Channel Zero, has offered to host a debate that includes May, saying the decision to leave her out is “just plain wrong” (http://www.winnipegfreepress.com/breakingnews/greens-elizabeth-may-will-fight-broadcasters-decision-to-ditch-her-from-debate-118927234.html). Let us be vocal in our anger at the Consortium’s exclusion of Elizabeth May and stand with her as she fights this bad decision. This was an undemocaratic move. Take action! Let’s send a message in this election to the other political parties that this slap in the face will not be tolerated. It is against everything we stand for in this country. Everyone has to be treated fairly. I apologize for not getting back to you sooner. I don’t have any events planned in Elizabeth May’s support. I hope today’s decision to include her in the debate is a favorable one because it is the right thing to do. The current government shows a lack of leadership by not speaking out against the decision which excluded May’s party from electoral debates. Hello, I’m a youth vote coordinator for the Green Party of Canada. As you probably know, Elizabeth May has been excluded from the leadership debates. We think excluding the only female leader is outrageous and expect to have several events around this issue. Can we call on your group for support in these events? If so, how should we contact you from planned and short-notice events? Her case will be heard Tuesday so a prompte response would be appreciated.